Summer Rain Private Estate is running a promotion during May 2017. This promotion is valid for one month from 1 May tot 31 May 2017. 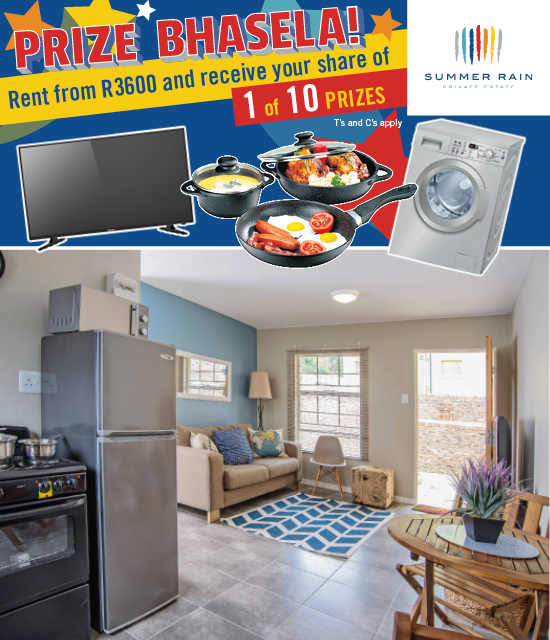 Each one of the first 10 people who sign a rental contract in May will receive a prize. The prize awarded will be based on the random selection the person will make. A poster with 10 cards is hiding a prize behind it, and based on which card the person will determine the prize awarded. Only once the person signed the rental contract, paid the deposit and admin fee a prize can be selected. The prize will be handed over on move-in day. The value of the prizes differ from one another. Summer Rain Private Estate administrator’s decision is final and once a selection is made the prize cannot be exchanged for something else. Summer Rain Private Estate retains the right to publicise the winners’ names and photos across all marketing material. Due to the fact that prizes are only awarded to those who sign rental contract, family members of staff who sign a rental contract can partake in the prize Bhasela. Summer Rain Private Estate management reserves the right to amend or withdraw the promotion in the event of any unforeseen circumstances outside their reasonable control. Entrants are deemed to accept these terms and conditions by entering the promotion. This promotion is in no way sponsored, endorsed or administered by, or associated with, Facebook. You are providing your information to Summer Rain Private Estate and not to Facebook. The information you provide will only be used for e-mail marketing purposes and not shared with any third parties. Summer Rain Private Estate may publicise the winners’ names and photos across any and all marketing material and/or channels. Summer Rain Private Estate is indemnified from any claims by any potential entrant due to difficulties experienced in submitting an entry, which in this case involves signing of a rental contract. Entrants are deemed to accept the terms and conditions stated above.